The Literary Lab's Notes from Underground Anthology will be available on Tuesday! I can't tell you how excited I am to get my hands on a copy of this book. And not just because it will be the first time I see one of my own works in print... published by someone else! ...but because as I skimmed through the proof copy of the text, trying not to read others' stories as I scrolled to find mine (I wanted to keep them a surprise until the finished book came out), my eye kept snagging on some of the sharpest, most outstanding sentences and phrases that I've read in a long time. 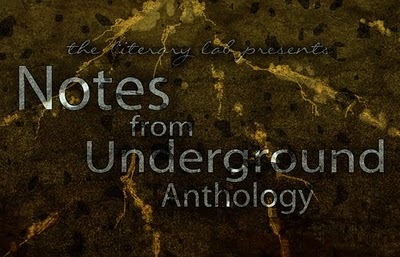 The Notes from Underground anthology project was a dangerous experiment. The hosts of the Literary Lab selected the contributors based on anonymous writing samples and then gave each writer free reign to submit ANYTHING they wanted to write--no rules, no editing--and promised to publish whatever was submitted. The result, on first glance, looks truly remarkable. The quality of the writing is impeccable, and the subject matter of the stories is diverse but consistently brave and vibrant. From start to finish, this anthology is an unleashing of creative energy unfettered by judgment or regulations. I feel humbled and also proud that I was given the chance to participate in this unique collaboration. My story, Notes from an Enchanted Castle, is a collection of smutty and ridiculous letters passed among the bored, ill-mannered servants of the Beast's castle (as in, Beauty and the). It's a fun tale. And I have a feeling that some of the other stories in the anthology are even better. I hope you'll get yourself a copy of the book, either in paper or eBook format, and tell us what you think. Oh, and by the way, the proceeds for this book will go to charity. Neither the Literary Lab nor the contributing writers will not receive any payment for this publication. We're promoting it solely for the excitement of sharing the work. Isn't it exciting? I can't wait to read your piece--it sounds hilarious.